He was well-known for his skills before the Clan formed, but only came to record with the group after a chance visit to RZA's Staten Island apartment-recording studio during the recording of Raekwon's album Only Built 4 Cuban Linx (see 1995 in music). Cappadonna visited the studio during the recording of the song "Ice Cream," and joked to RZA about him contributing a verse on it; however, RZA decided to take him seriously and allowed him to feature on the track. After appearing on "Ice Cream," he went on to appear on another Cuban Linx track, "Ice Water," and became a close affiliate of the Clan with several appearances on (and a co-starring credit on the front cover of) Ghostface Killah's Ironman album as well as several prominent appearances on the group's second album Wu-Tang Forever in 1997, most notably on the stand-out lead single "Triumph." However, his appearances are widely criticised for lacking flow, acceptable levels of lyricism, or sometimes even a coherent rhyming scheme. His verse on Ghostface Killah's "Buck 50" is often cited as an example of this. 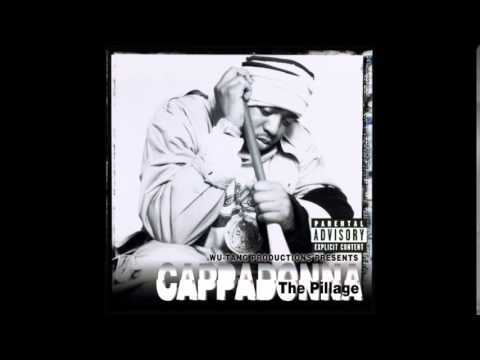 Cappa's debut album The Pillage was released in early 1998, one of the first post-Forever releases from the Wu-Tang stable, and received mixed but generally positive reviews. When the next Wu-Tang group album, 2000's The W, arrived, Cappa seemed to have become an official member of the Clan; on Wu-Tang Forever his appearances were marked with "featuring Cappadonna" (as with other affiliates like Streetlife & Tekitha), but on The W Cappa's appearances were not marked in this way (whereas Street Life's remained designated as "featuring"). He also appeared with the original members in all the album's publicity shots and cover art, and was given equal billing in Sony Musicï¿½s press kit for the album. His second album, The Yin & The Yang, was released in 2001. The lead single "Super Model," featuring Ghostface Killah, was moderately successful but the album was poorly received. Cappadonna was an absentee from the Wu-Tang Clan's fourth album Iron Flag, released in late 2001. In the year since the release of The W, Cappadonna had reportedly become dissatisfied with being in the group and had also got into dispute with the group over the revelation that his manager Michael Caruso was a police informant. Whatever the case, Cappa did not appear on the album. It is highly likely that he recorded with the Clan at the album's recording sessions, but was edited out of the album at the last minute (Clan leader and producer RZA is known for rearranging verses and song structures very late on in the recording process), as he participated in the photo shoot for the Iron Flag album cover, but was later airbrushed out (one of his legs remains on the cover). In other shots from the same photo shoot, such as that which appeared on the back cover of the The RZA's 2004 book Wu-Tang Manual, he is clearly visible. For some time after the release of Iron Flag and his hiatus from the group, Cappadonna was forced to resort to more pedestrian means of earning income, and it is known that he was a taxi driver in Baltimore for eight months. Rumors abound about his brief change in vocation: it is hypothesized that he did so in order to support himself and his family, while Cappadonna's own explanation is that "he intentionally gave up what material possessions he had amassed and walked the streets of Baltimore for 8 months, before returning to the rap game" . Regardless, he returned to the music industry shortly, releasing 2003's The Struggle album. This album featured some Wu-Tang Clan members, and was released on Wu affiliate Remedy's record label, although Cappadonna maintained at the time he was not directly associated with the group itself anymore. In fact, publicly, he later accused RZA of cheating him out of royalties, a charge that RZA strenuously denied. Cappa's differences with the group appeared to have been forgotten when he joined the whole Wu-Tang Clan for their reunion concert at the Rock the Bells music festival in San Bernardino, California (the concert was later released on DVD and CD as Disciples Of The 36 Chambers) and appeared with the whole Clan on their early 2006 club tour as well as on the acclaimed Ghostface Killah track "9 Milli Bros." off his 2006 album Fishscale where he references his stint driving taxis: "Diggler, AKA the Cab Driver / Drop 'em off in the middle of fire / Dirty Island, drag bodies to the Murderland [Maryland] / Knock niggas out hurtin' my hand." Book Cappadonna for shows and concerts at Heavy Rotation booking agency. Worldwide Bookings with HR Booking. Cappadonna Booking, Book Cappadonna. Book artists like Cappadonna, Cappadonna booking agent, contact Cappadonna email, Cappadonna manager, Cappadonna management for concerts, bookings, biography, pictures, videos. Cappadonna may be available for your club shows, private party, festivals or other events.